Toronto woman, Judy Jones, hadn’t always considered herself “lucky” when it came to cars. It wasn’t until her visit to local Master Mechanic Mark Davie from Meadowvale that her luck changed. 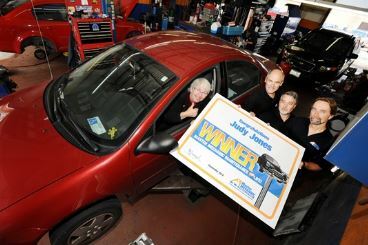 After entering in Master Mechanic’s 2012 contest, Judy Jones was granted Free Car Maintenance For Life. As long as she continues to drive her 2006 Chrysler Neon, Judy will continue to receive free car maintenance for life. The 2006 Neon just needs to keep running for her prize to be upheld, a clause Judy isn’t too worried about with her continued service from trusted and experienced Master Mechanic Mark Davie. Before this contest, Judy Jones wasn’t having the greatest experience with her cars. After a long weekend, while her white Neon was parked, and thankfully empty, a drunk driver smashed into her car leaving it at a total loss. The next long weekend, Judy was on a walk when she was hit by a car, resulting in her spending 4 months in a wheelchair. Sadly, her car troubles didn’t stop there. After spending months looking for her new, and current Neon, she finally found it. Her new car unfortunately broke down one day on the way to work, which left her looking for a local mechanic. Thankfully, after a recommendation by her brother, she called Master Mechanic Meadowvale. Afraid this would be an expensive trip to the mechanic, Judy was relieved when Davie called to tell her the repairs would be half of what she was expecting. At the time, Davie told her: “it makes you feel good to call and give someone good news for a change”. Mark Davie has been working at the Master Mechanic since 1991, and decided to take on ownership of the franchise in 1999. After her positive experience at Master Mechanic Meadowvale, she filled out a ballot for the Free Car Maintenance For Life contest. We’re so happy to have a great customer like Judy Jones. Hearing of her past car troubles, we’re pleased to know she has found a trusted Master Mechanic and that her luck with cars has changed! Hugh Welsford and Jamie Holmes, Master Mechanic Inc. owners, congratulate Judy Jones for winning the Car Maintenance For Life contest, out of 1,000 other entries. Established in 1982, Master Mechanic Inc. is proud to support 39 franchise locations throughout Southern Ontario. They are recognized by many for their high quality auto repair and regular vehicle maintenance, and hold strong relationships with their continuous customers.